CALGARY – A proposal to build the second phase of the Sturgeon Refinery, the first new refinery in Alberta in the last 30 years, is being withdrawn as the company behind the project evaluates the changing economic environment facing the oil industry. 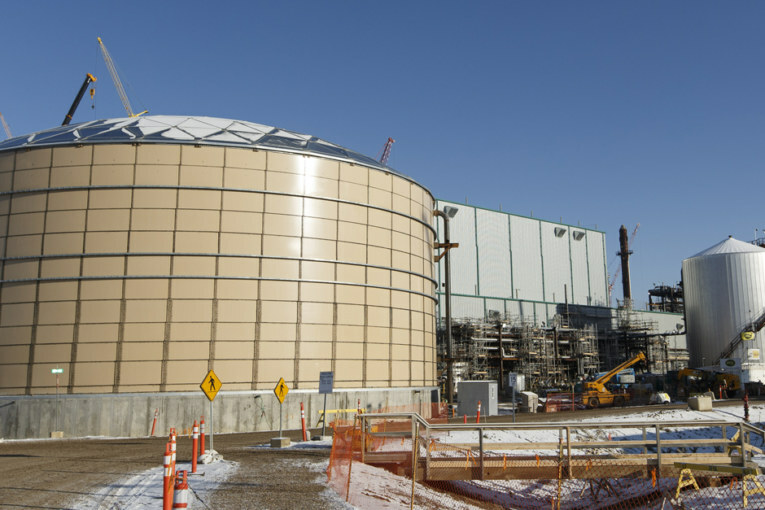 North West Refining and Canadian Natural Resources Ltd. are joint partners on a 50,000-barrel-per-day phase of the Sturgeon Refinery near Edmonton that partially started up in December. The first phase was built with support from the Alberta government in the form of loan guarantees and commitments by the province to refine a portion of the bitumen it collects through a royalty-in-kind program at the Sturgeon Refinery. Those commitments came under increasing scrutiny as costs for the Sturgeon Refinery ballooned from previous estimates of $5.7 billion in 2013 to $9.5 billion. The two companies had submitted a proposal to the Alberta government for a second phase roughly a year ago, to expand the refinery’s heavy oil-processing capacity to 100,00 bpd. North West Refining already has regulator approvals in place for the second phase and a potential third phase, but there is currently no timeline for construction to start. That proposal is now being withdrawn until the partners can demonstrate the initial phase of the refinery is working as expected. The Sturgeon Refinery has started producing diesel from light oil but construction is not yet complete on the parts of the project that would allow it to refine heavy oil into diesel. “We think it’s the right thing to do,” North West Refining president and CEO Ian MacGregor told the Financial Post on Friday, adding that he expected construction of the first phase to finish by the summer. “The proposal is about a year old and a lot has changed since it went in,” MacGregor said, adding the discount Canadian heavy oil faces relative to U.S. light oil has changed dramatically and the proposal for the second phased needs to be updated. Alberta’s NDP government has previously said it wants to see final costs for the first phase before considering an expansion. Alberta Energy Minister Marg McCuaig-Boyd did not respond to a request for comment Friday. Canadian Natural has taken a similar wait-and-see approach. “I think our plan here is let’s just make sure the plant runs effectively and efficiently. And when we see that, then we’ll make a decision whether or not to participate in any kind of expansion, if it makes sense,” Canadian Natural Resources Ltd. executive vice-chairman Steve Laut said on an earnings call Thursday. While the provincial government has been non-committal on supporting a second phase for the Sturgeon Refinery, at the end of February Alberta Premier Rachel Notley announced a new $1 billion program to support partial upgraders – an early-stage technology that would process bitumen to the point where it can flow through a pipeline without diluent, but not all the way to the point where it can be refined as gasoline or diesel. MacGregor said he’s not concerned that Notley’s support for partial upgrading would weaken possible support for more refining. “I’m in favour of it all the way,” MacGregor said of the new program, which he called “a really strategic move” that could be as valuable to the local oilpatch as the government’s investments in steam-based oilsands technology decades ago, which has since unlocked billions in oilsands reserves. The province has promised $800 million in loan guarantees and $200 million in grants for partial upgraders over the next eight years. “I don’t think that’s competitive in any way with refining. We need every possible way we can to get (oil) out of this place,” MacGregor said.